These are the "little guys" of my kit. 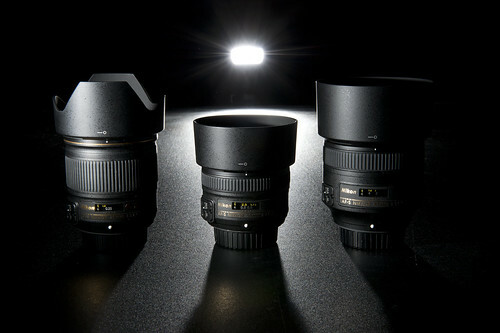 From left to right we have the 28mm f/1.8, 50mm f/1.8 and 85mm f/1.8. They are amazing little lenses and a lot of fun to shoot with! A little about the shot. Lenses were set up on my ping pong table which surprisingly is an amazing surface to shoot off of. SB-600 was camera left about 2' away, 50mm, 1/16 power. SB-700 on the other end of the table firing back at 120mm, 1/4 power. Triggered via Yongnuo radio triggers.